They wore cat ears and leopard shoes. “Meow” was the rallying cry. And healthy competition drove the bidding for cat-centric auction items, such as a catered dinner surrounded by feline friends. While spirits were high and the drinks were flowing, the cause was no trivial matter. Cat Town hosted its Second Chance Soirée on Saturday, Sept. 29, a fundraiser to support the life-saving work of rescuing vulnerable shelter cats. Animal lovers, city leaders and Cat Town’s community of volunteers gathered at Oakland’s historic Preservation Park to celebrate the nonprofit’s success at reducing the city’s feline euthanasia rate — and its potential to transform cat rescue nationwide. Oakland Mayor Libby Schaaf kicked off the soirée by recognizing the public-private partnership that supports the city’s often overwhelmed open-admission shelter. 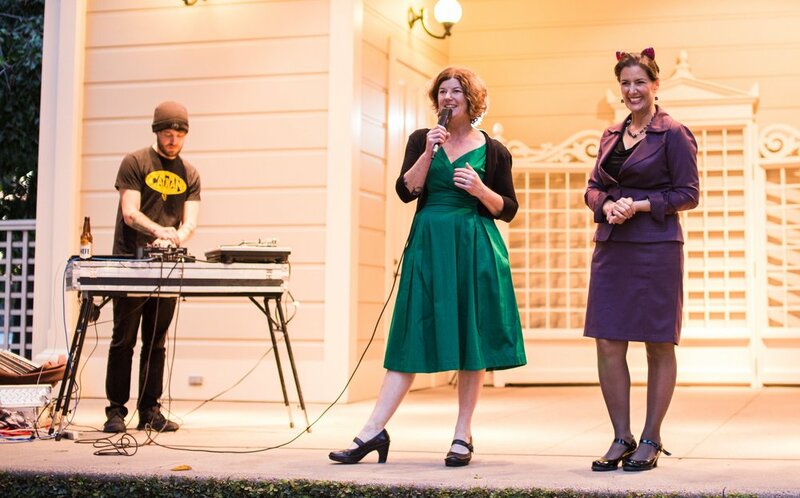 From left to right: DJ Adam Myatt (AKA The Cat Man of West Oakland), Cat Town Founder and Executive Director, Ann Dunn, and Oakland Mayor Libby Schaaf. Photo by Nautilus Lens Photography. Cat Town, founded in 2011, has helped cut Oakland’s feline euthanasia rate by 70 percent by giving senior, sick and stressed cats a second chance at finding loving homes. And through an apprentice program, animal rescue workers shadow Cat Town staff, and then take what they learn back to shelters around the country, helping expand the concept of what is possible. Despite robust support from the community, Cat Town is not yet sustainable from a funding standpoint, Executive Director Ann Dunn told attendees. In addition to grants and donations from business partners, Cat Town continues to rely on donations from individuals to cover operating costs. Funds raised from the soirée, Cat Town’s largest event to date, help support essential programs, such as: the Forgotten Kitten Project, which intervenes with older shelter cats deemed “unadoptable” due to their lack of socialization; In It for Life, which covers veterinarian costs for adopters of senior cats; and the Emergency Medical Fund, needed to cover both routine and emergency health services associated with the special-needs population Cat Town serves. The soirée featured remarks from Feline Minds behaviorist Dilara Göksel Parry, who described the Cat Town’s successes in transforming under-socialized cats. Michael Colbruno, board chair of East Bay Animal PAC, emceed the event. The Second Chance Soirée committee members let loose after a successful event. Photo by Righter Portraits. The event would not be possible without the support of the event planning committee, made up of volunteers Victoria Gaston, Jill Erbland, Hali Burbige, Cammane Wun and Maple Molina. They were supported by Cat Town staff Quinn White and Cathy Niland, and led by Cat Town's Board Treasurer, Jamie Miller. A special thank you to local businesses and artists that supported the soirée by donating items and services. We can’t wait to see our community at next year’s event! Stay up to date on future event announcements by signing up for our newsletter.